Brittany J. Alston is an Associate in the Energy and Oil & Gas industry groups, focusing primarily on business law and real estate. She practices out of the Firm’s office in Morgantown, West Virginia. Brittany routinely handles matters involving mineral transactions and acquisitions, including the coordinating and performing of due diligence and title defect curative work. 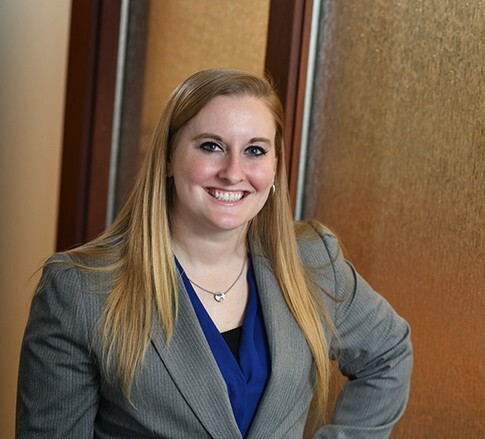 In addition to her work in the energy industry, Brittany also assists in various commercial transactions, including tax-exempt financings, lease-purchase agreements, and general commercial acquisitions. She enjoys interacting with clients and helping them solve their issues, which is highly reflective in her work drafting agreements for commercial property deals. When Brittany is not in the office you can find her on the softball field or at home relaxing with a book in her hand. She grew up on a small farm where she was heavily involved in her local 4-H club, and today is the proud owner of four cats. Brittany’s competitive spirit can also be found in her work ethic by solving the challenging puzzles that come with Title Searches. Brittany is actively involved in her community. She currently serves as a board member of the Northeast WV Chapter of the American Red Cross. She also chairs its BioMed Committee, in which she acts as liaison with the District Blood Services team to coordinate efforts in partnering and fundraising. Whether she’s aiding her local community or those in her office, Brittany is an asset to the Firm and continues to display her helping nature through her service to her clients.